THIS FRIDAY, SATURDAY OR SUNDAY– EAT AT RUBY TUESDAY – HELP THE HORSES. 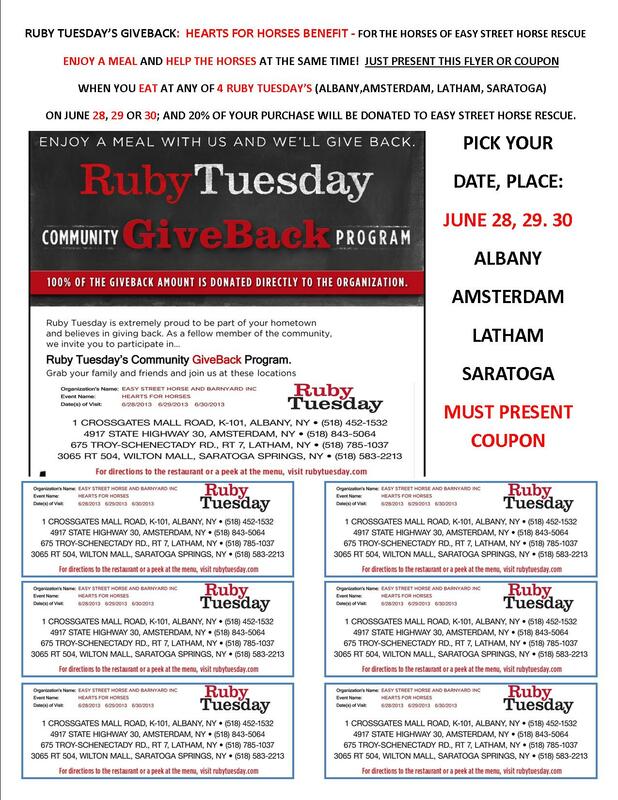 PRESENT YOUR COUPON AT THE ALBANY, AMSTERDAM, LATHAM OR SARATOGA RESTAURANTS. EAT ONE DAY OR MANY DAYS. 20% OF YOUR PURCHASE IS DONATED TO THE HORSES IT’S THAT SIMPLE! PLEASE SHARE THE ATTACHED FLYER WITH COUPONS…MUST HAVE COUPON!